Flags are all over place. At every corner when you wait at the red light or when you wait in line at the airport. Every business needs a custom flag at some point. Let us make your next flags. We have various shapes and sizes. Select your shape and we will prepare a FREE visual mock-up. 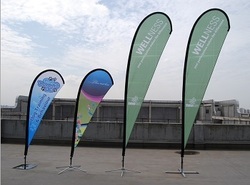 Nice and fitted tear drop shaped flags are an easy solution for printed flags. These flags come in small, medium & large. With more real estate on your printed flags you can get creative with your new custom flags. The traditional feather flags. Can't go wrong with these. These flags come in small, medium & large.